We are not made of sugar. We are the salt of the earth. It was one of the dark moments of my life when I decided to follow the Footsteps of St. Francis of Assisi. The very first pilgrimage I did, alone. Of course, it took planning and reaching out to strangers. Sending out e-mails mostly to the Franciscans and Sisters in Rome. They are very helpful. Hello, my name is Maria Siglos. I am writing to seek your help if you could provide me with contact e-mail in Assisi, Italy for any retreat centres or catholic homes who would like to accommodate me during my visit in September. Your help is greatly appreciated. Thank you. Waiting and patience is very important when embarking on a pilgrimage. They say everything is in God’s time. These qualities did not exist in me at the time. For one, I want to run away, throw in the towel and enough of the so-called career and professional life. I quit my job of 14 years. But I have no choice but to wait and see. I prayed to all the Gods: Shiva, Ganesha, Buddha, St. Francis, Jesus, Mary and Joseph. Finally, I received a response. Fr. Gregory forwarded your letter but I am just back from vacation and tomorrow I am on my way to Assisi… if you are online now, please answer immediately and I might be able to help you by getting the info tomorrow. I would appreciate knowing what you are looking for… there are guesthouses and there are probably retreat houses. How long do you plan to be in Assisi? Are you looking for private time? For a directed retreat? Are you looking for 4 star? Are you looking for modest places = shared bathrooms? Retreat places are likely to be basic. Do you have an idea of your dates? Please furnish any other info you might think is helpful. Oh? Too many questions! I thought it’s just as simple as booking a hotel and I am on my own. St. Francis didn’t have to answer to these questions. All he did was divest himself in front of the church and left Assisi. What I need is private room with spiritual direction. Being not in the right frame of mind, I really do not know what to do. I simple replied whatever that they can provide, I will be grateful. Year 2000 was Jubilee Year in Rome, I found out. A very special year when one of the sealed doors of Vatican Church will open and will shut again for another 25 years. Imagine Rome and Assisi are buzzing with pilgrims and tourist alike. Good luck finding a place to rest. It has taken a while but I have now obtained the necessary information. One of the friars in Assisi did a bit of telephoning and searching. I need to say that in Assisi they are very full as far as accommodations are concerned. I believe this myself because some friars here in Rome have been looking for places for friends coming to Rome and they are pulling out their hair… everything seems to be packed here in Rome and by extension in Assisi. Maybe prayer is not the answer. Maybe I will challenge God. Maybe I will give St. Francis of Assisi a threat. NOW HERE THIS! I said in my mind. Instead I said, whatever St. Francis. If you want me to come, I will come. Surrender. When I completely surrender myself to God, it works. I breathed a sigh of relief. I have found a single room in a guesthouse run by the friars at Porziuncola. There are two guesthouses. This is the simpler of the two, prepared to make things within the reach of simple, working class pilgrims. The dilemma of travel arrangement is over and a new fear surfaced. I have no job to come home to. Back to prayer again begging St. Francis to help me find a job. Not a career but a job that is a means to an end to continue being of service to humanity while I live on earth. A week before I departed for Assisi, I received a job offer, an answer to my prayer. The people who hired me were willing to wait for my return even though they needed a person immediately. Another sigh of relief. With everything in placed I went with peace of mind, walked the plains of Porziuncola, climbed the mountain to reach his hermitage and scrambled my way up to the hills of Assisi to visit San Damiano where he heard the Cross spoke to him to build a church. 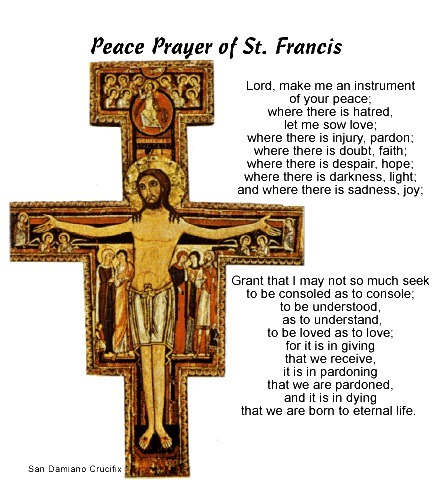 St. Francis of Assisi is real. A person who lived in life of luxury, partying and drinking. He joined the war, captured and imprisoned. During his imprisonment he was dangerously sick, body mind and soul. After his release from imprisonment, in the forest he met a leper. Leper is the lowest of the lowest, the untouchables. But Francis touched, embraced and kissed him. From then on, a new Francis rose and started a new movement. That was lifetime ago, another 14 years. Currently, I am still working for the same employer. A job that I like, love the people I work with and doing service in between. The teaching of St. Francis touches and helps me. It’s plain, simple and ordinary; yet, it provides a great lesson and instruction for living.